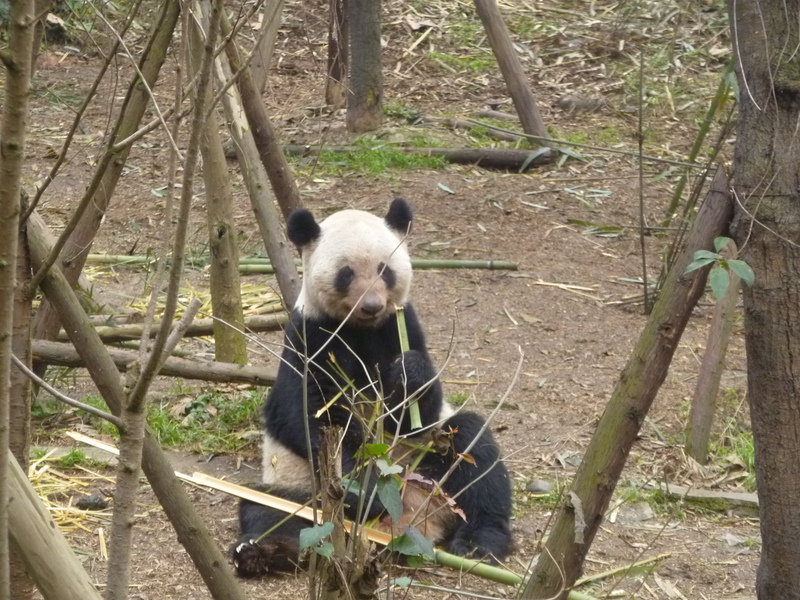 As for right now, how about some more panda photos, courtesy of the trip Dad and I took to the Chengdu Giant Panda Breeding Reserve last month? 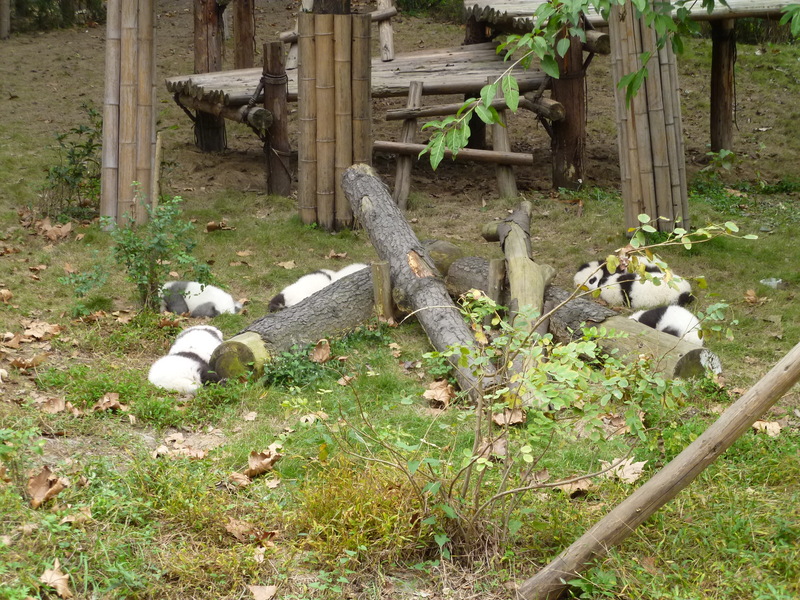 Since it was rather chilly out (in the low 40s, I think), the pandas were exceptionally chipper and active. Protip: go to the zoo in the cool weather and drizzles, people. The animals are way more interesting when they aren’t lying there, wishing for air conditioning. 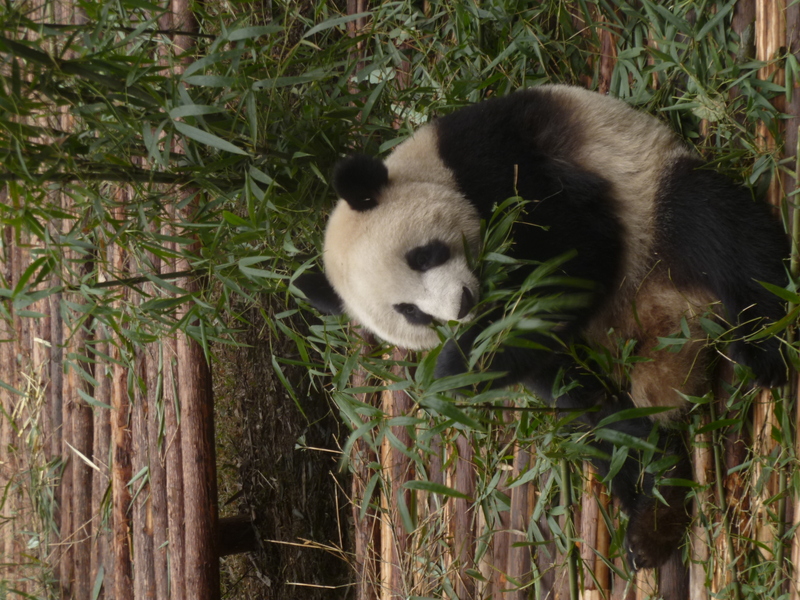 Here’s a medium-sized one, nomming on bamboo. This little guy kept trying to climb up the rope upside down. It was too cute for words. These three were pacing in circles around the entrances to the cages. The little one kept bugging her big sister. This was one of the fully grown males they had on site. Very big dude, but they get fed quite well here. nearly extinct snow leopard, you’d think red pandas wouldn’t be so rare. 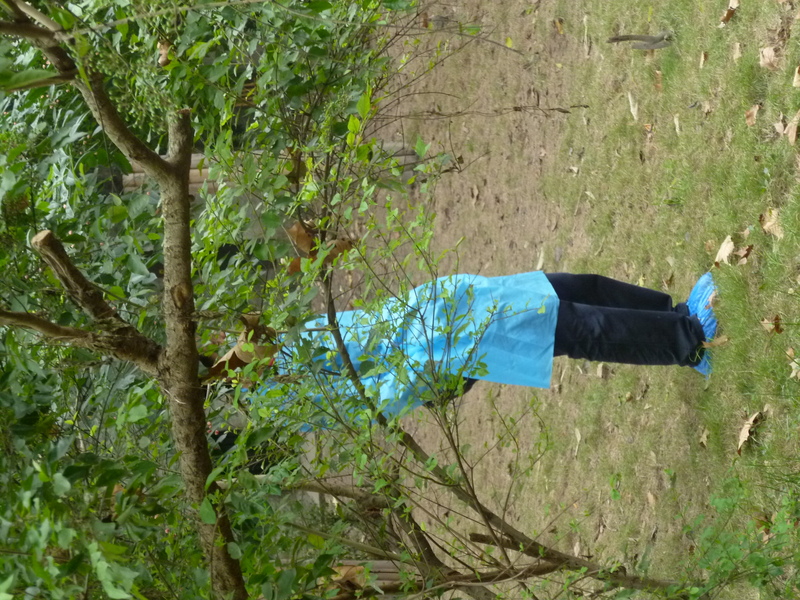 As Dad and I were wandering around the zoo, we heard a bird call. Specifically, we heard Kevin’s birdcall, from “Up“. Since I had just watched the movie, I freaked out. 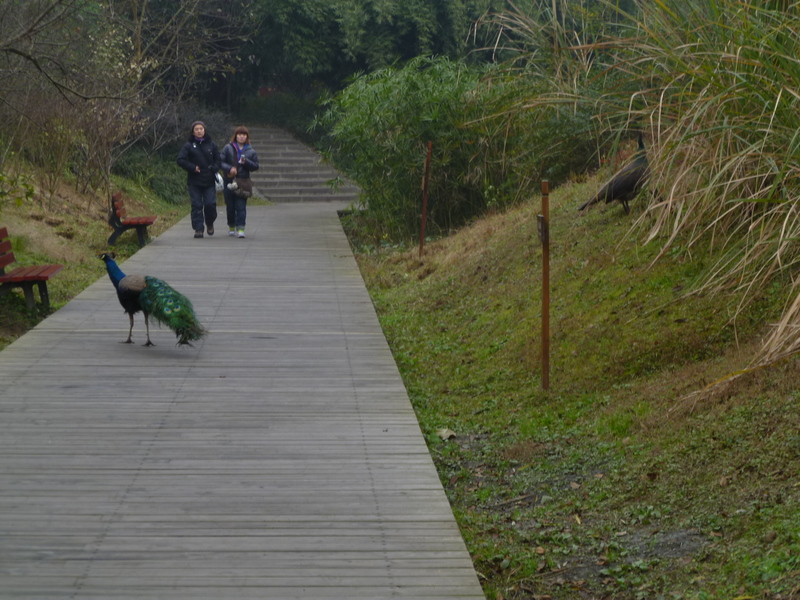 It took a while for us to realize that the call we were hearing was a peacock (left center) wooing his lovely peahen (upper right). You clever Pixar animators, you. 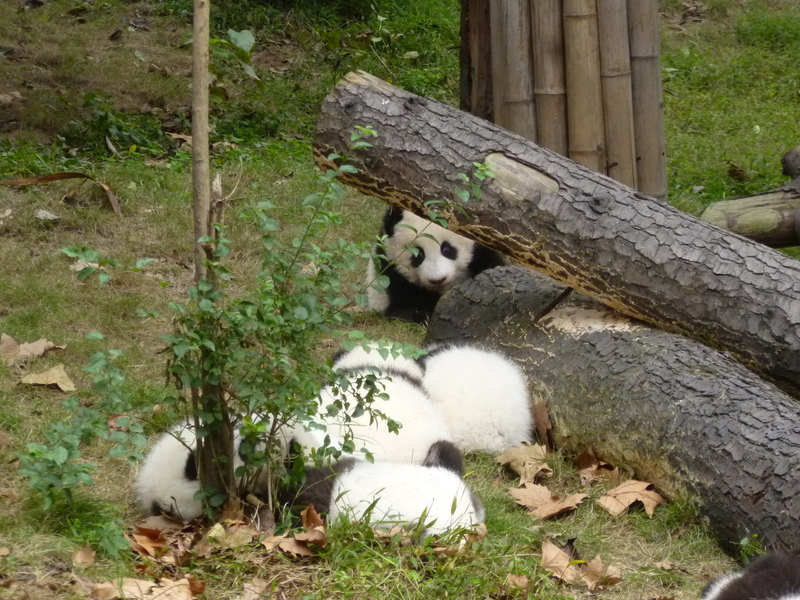 Have some baby pandas instead. h/t Susan. Thanks for feeding my obsession with these adorable yet useless creatures! 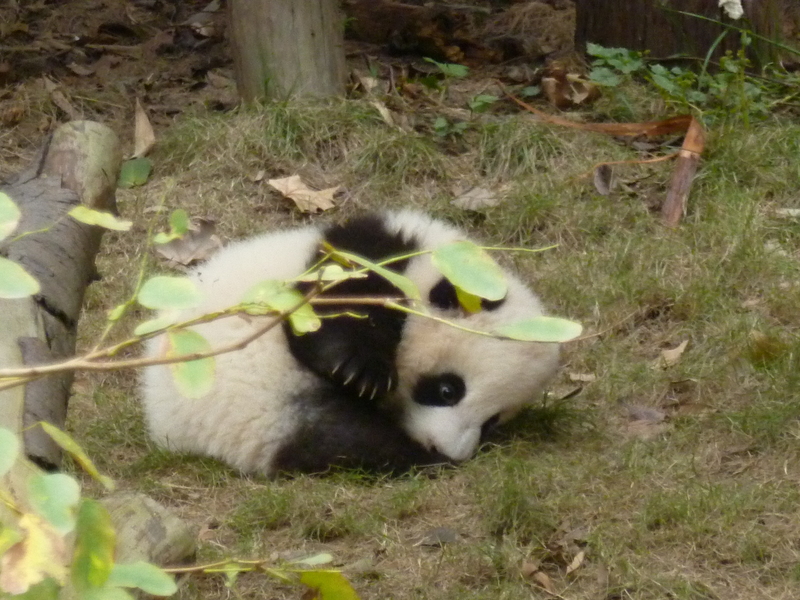 The first thing people ask me when they hear I’m living in Chengdu is if I’ve gone to see the pandas. (Despite what others may think, the Chinese government doesn’t actually hand every visitor a baby panda to hug once they land in the mainland. I was disappointed too.) Sichuan Province is the native habitat of the giant panda and some 1600 pandas still live in the wild, eating bamboo and hanging out in the mountains. I wasn’t technically supposed to be on the field trip – it was for language students and I’m a member of the History Department – but much like how the average Westerner has a hard time telling Asians apart, the vice versa is also true. There was no one who knew each and every one of the students and could point to me and say, “hey, you don’t belong here!” so I got away with sneaking along. This was a good thing, but I was willing to pay the 50 kuai entrance fee if everything fell apart. 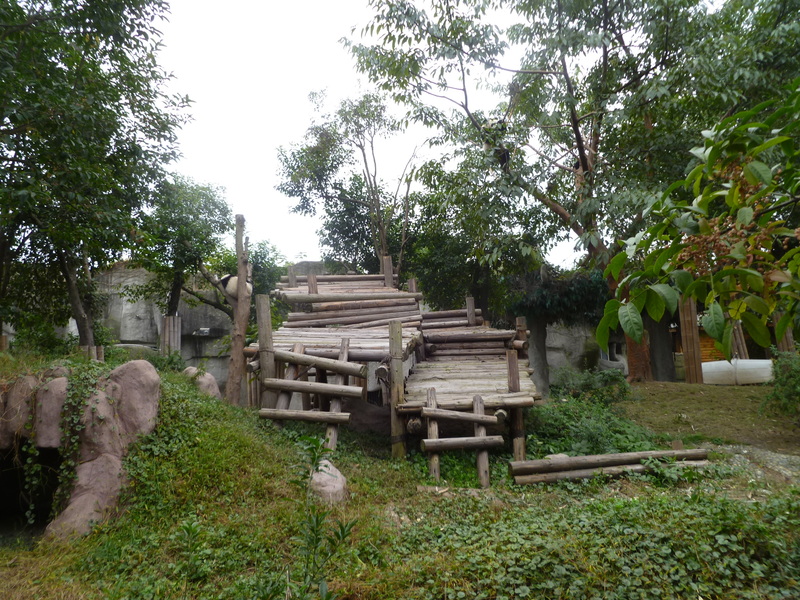 Inside the park, the giant horde of foreign students meandered our way up to the top of the hill, where the baby panda enclosures were located. And omg they were so cute. Eight little fuzzballs were sleeping by some logs, looking absolutely adorable. There was much squeeing on our part. 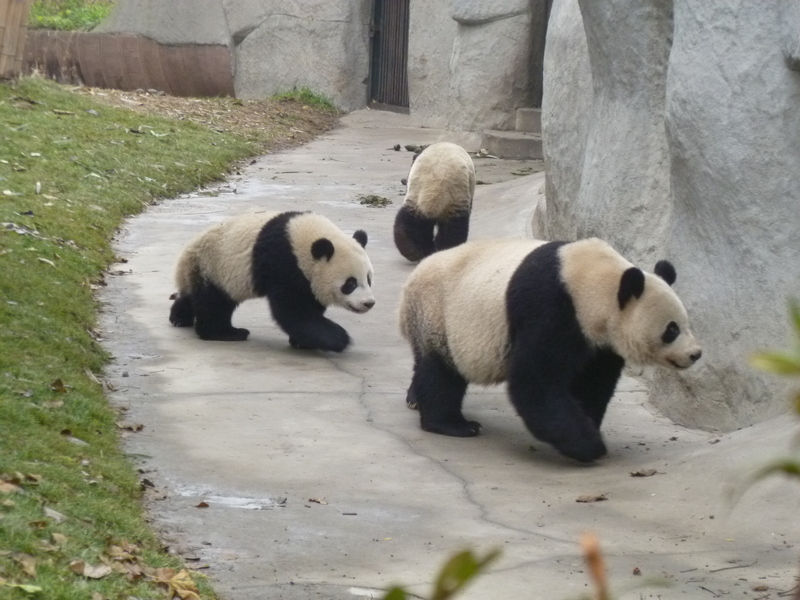 Katia, Kay, and I considered the dimensions of my bag and the size of the average baby panda. Surely we could fit one in? Unfortunately, there was a vigilant guard standing nearby. Boo, I say. No panda-napping for us. We moved around the park by age: after we spent a lot of time cooing and squeeing at the panda kindergarten, the adolescents were next. 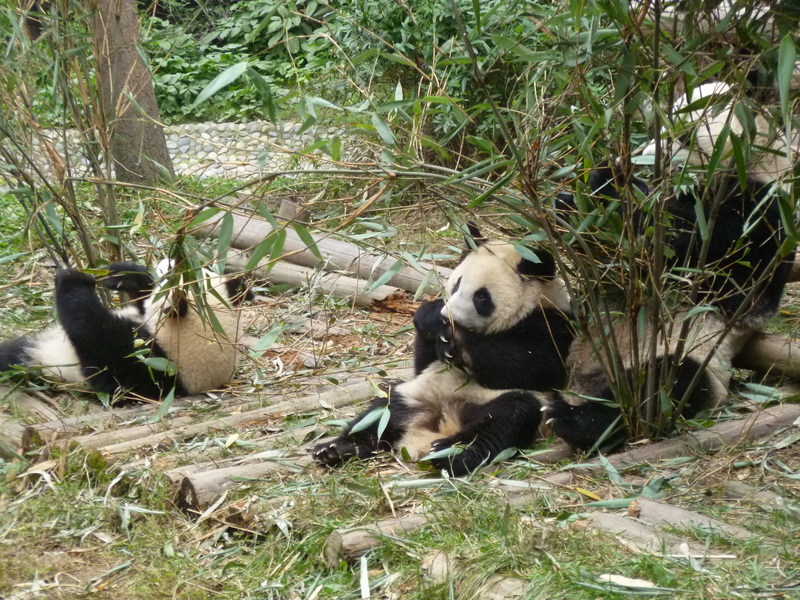 These three pandas were just hanging out, eating bamboo. Bamboo is practically worthless in terms of nutrition, so the vegetarian pandas have to eat a LOT of it to keep themselves alive. 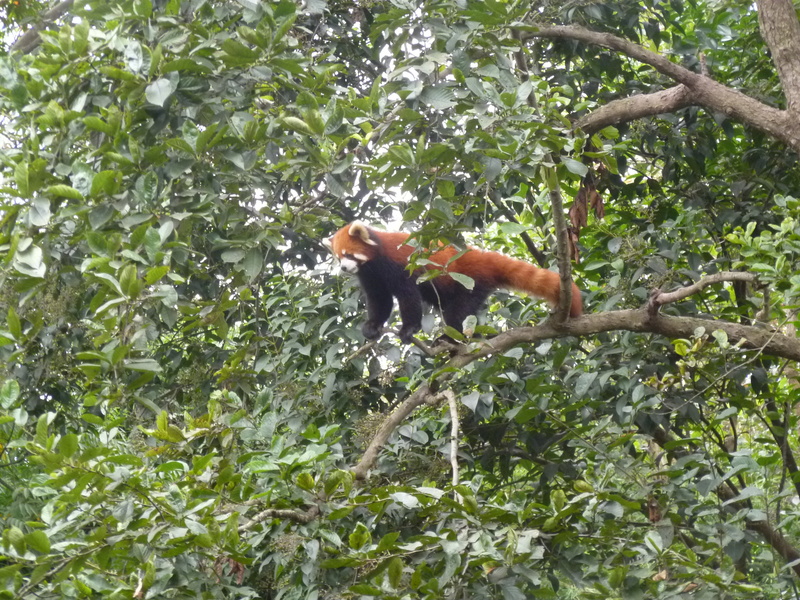 There were a few other pandas hanging out in trees, which is a kind of weird thing to see. 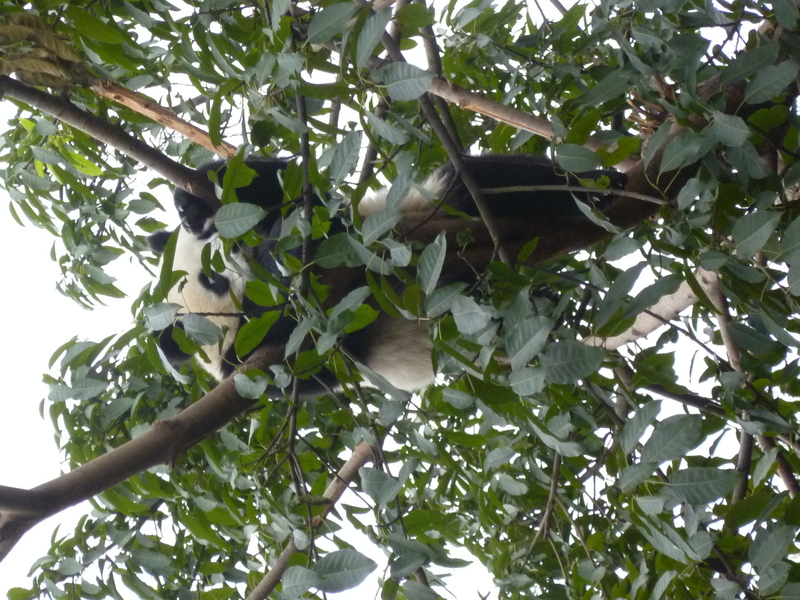 I mean, pandas are super ungraceful on the land, and yet able to snooze up in the branches. Rock on, pandas, rock on. There are three pandas in this picture. Can you spot them all? We asked a guard how much the fully grown male panda weighed. He responded, “hmm, about 228 kilos.” Oddly specific, but there you go. 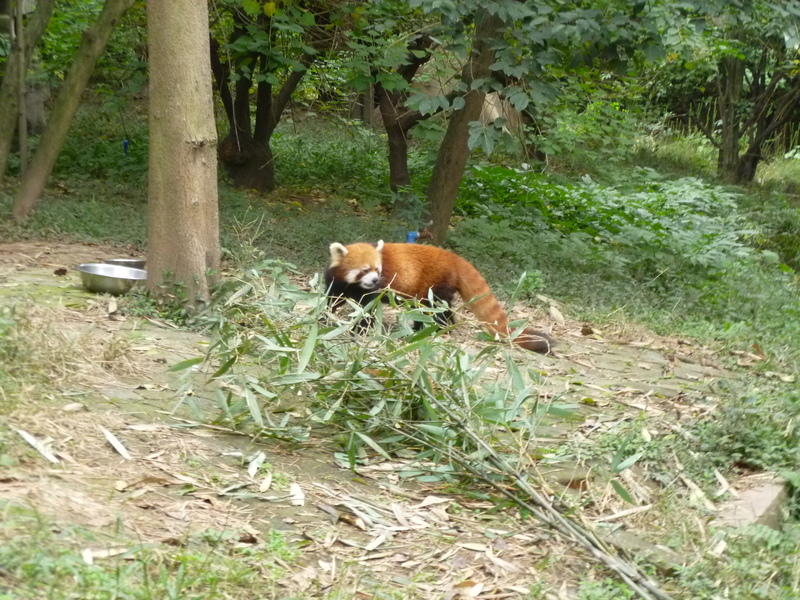 The park also had a collection of red pandas hanging out and doing red panda-y things. 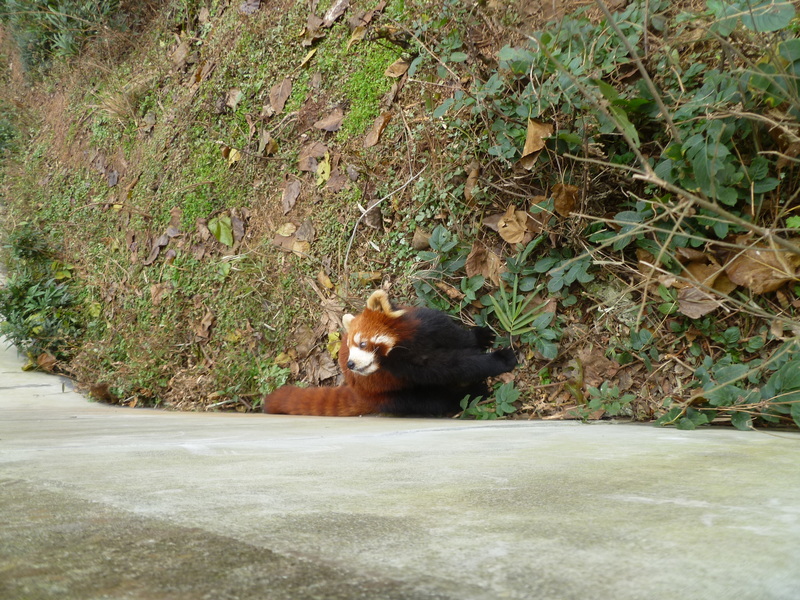 This enclosure was full of the mostly-ignored red headed step-children of the park. They were pretty cute, for raccoon-type animals with super fuzzy tails. This was definitely a fun trip. No, I did not get to pay an aburd amount of money to hug a panda, that’s at a different breeding reserve. (Also, I’m a broke college student. What makes you think I can afford to hug a panda?) It was definitely a good way to spend an afternoon. 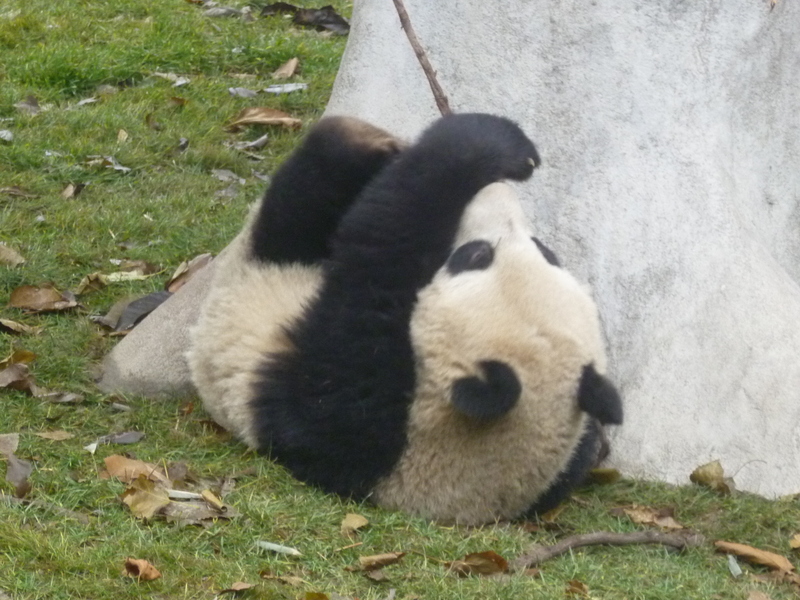 And hey, it’s only a 30 minute bus ride away, so I can come back and visit the pandas again. 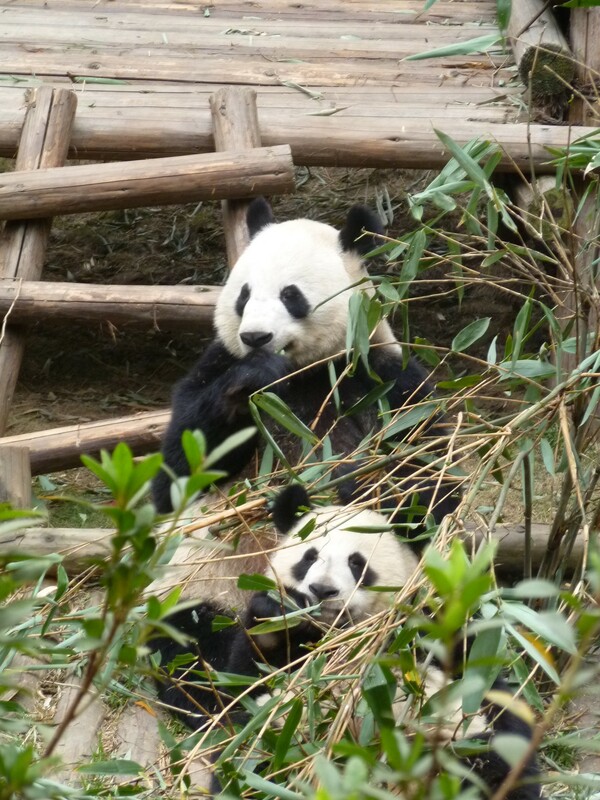 More information: this article on the Wolong Panda Breeding Reserve by James Fallows is pretty interesting and informative.